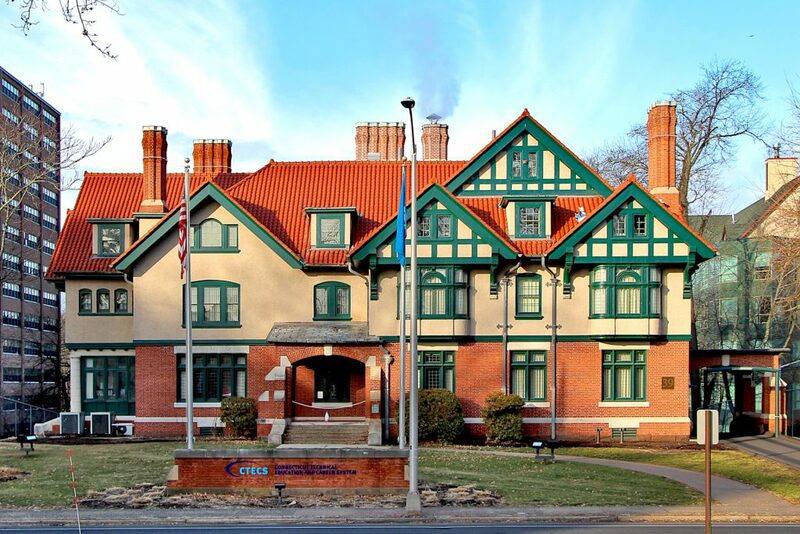 The well maintained building at 39 Woodland Street in Hartford is identified by the Structures and Styles book as the Melancthon W. Jacobus, Sr. House. 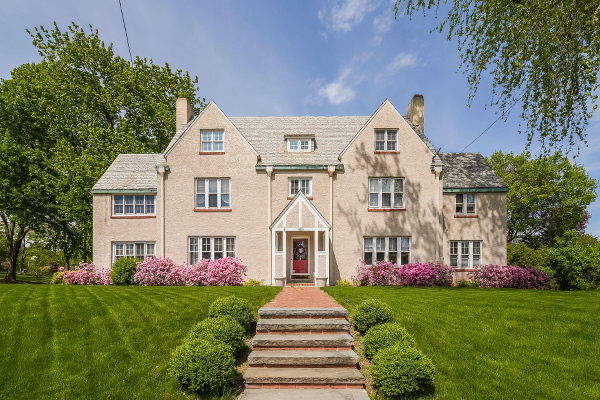 Its Tudor Revival architecture is in excellent condition 110 years after construction! Kudos to the State for the recent maintenance to keep the 29,571 square foot structure looking good. The building is currently the central office for the Connecticut Technical Education and Career Center. 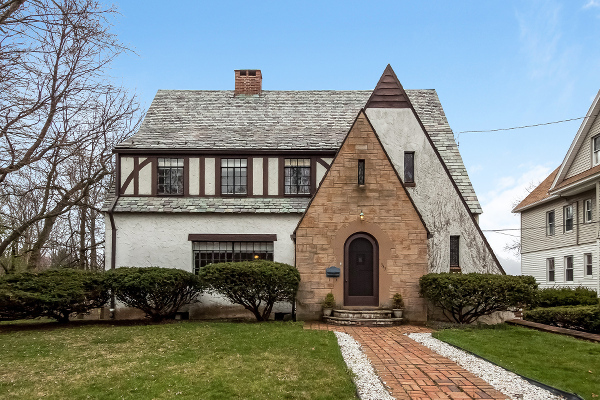 The half-timbered front gable, accented with a decorative band and flanked by ornate masonry chimneys, allow this stately Tudor Revival home to effortlessly stand out on one of Hartford’s most prestigious blocks. 222 North Beacon Street includes a full width front porch with more than enough space to entertain. The foyer is a room unto itself, and includes a gas fireplace, grand staircase, built-in benches, and powder room. Extra tall windows bring a tremendous amount of light into the first floor living and dining rooms, both of which also feature gas fireplaces. French doors lead from the living room into a large den. The fully updated kitchen features custom cabinetry, stainless appliances, stone counters, eat-in space, and two pantries. Upstairs, the second floor landing could be used as a casual seating area away from the formal entertaining spaces downstairs. The master bedroom suite includes a wood burning fireplace, full bathroom, and double closets. A second bedroom suite also includes a full bathroom, while two additional bedrooms complete the level. The third floor has additional bedrooms with built-ins and another full bathroom. The property has a gas heating system and is cooled by strategically placed ductless air conditioning units. Outside, there is a patio off the kitchen, a fenced yard, and a two car garage. The home is steps away from historic Elizabeth Park. Don’t miss this rare opportunity to live in an architectural gem! 222 North Beacon Street is offered at $525,000. If you’d like to see this home, please have your agent arrange a showing or call Amy at 860-655-2125 to schedule a visit. More details and a photo tour are available. This light-filled Tudor is thoughtfully updated, meticulously maintained, and a joy to call home. Set on 0.36 landscaped acres, on a quiet neighborhood street, this 3,789 sqft, 6 bedrooms, 3.1 bath property welcomes you with a gracious entry and grand staircase. The first floor offers an oversized formal living room with a fireplace, panel & crown moldings, and French doors leading to a large sunroom with arched brick work and front patio. The formal dining room is generous in size and contains the same molding details, and a bright den includes built-in shelving. The recently updated eat-in kitchen is both functional and stylish, with custom cabinetry, stainless appliances, stone counters, eat-in space, Jotul gas stove, and a feature by Houzz. Upstairs you’ll find a large master bedroom with fully renovated bath, 3 additional bedrooms and another updated bath. The third floor contains 2 more bedrooms, another fully renovated bath, and ample storage. The home includes replacement windows, central air, newer gas heating system, and irrigation. A walk-out lower level features a workshop space, laundry room, and four garage bays. Outside, the fenced back yard has been redesigned to include a patio, numerous garden beds, and a custom shed. This lovely home is truly in great shape – just move right in and enjoy! 114 Westerly Terrace is offered at $525,000. If you’d like to see this home, please have your agent arrange a showing or call Amy at 860-655-2125 to schedule a visit. More details and a photo tour are available. 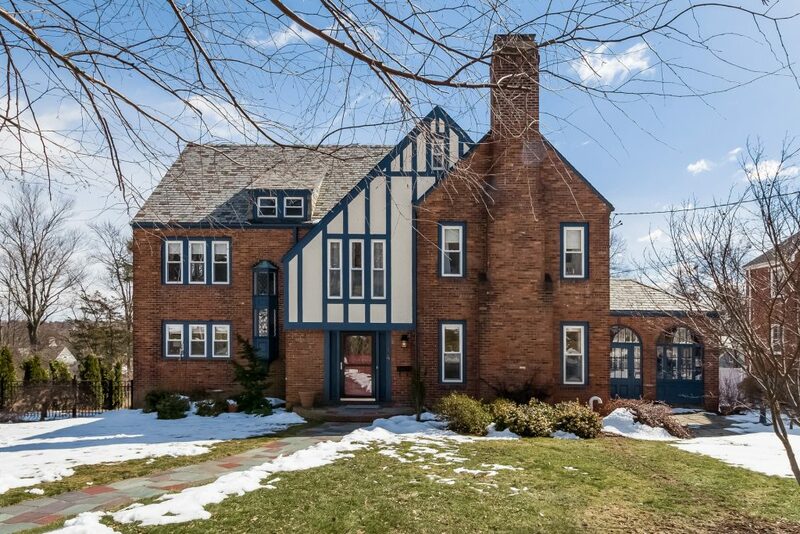 Welcome to a stately Tudor, adjacent to historic Elizabeth Park in Hartford’s West End. 140 Elizabeth greets you with a spacious foyer with new hardwood flooring and grand stairs. The front to back living room features a charming fireplace with an insert, and continues to a sunroom overlooking the park. The dining room is a nice size for entertaining, with a French door leading into an office with built-ins and another fireplace with stove. The updated kitchen has an eat-in counter, stainless appliances, and silestone counters. There is a large window that connects the space to the private patio just out back, ensuring easy access to the grill. The main level is completed with a powder room, and access to the attached 1 car garage. Upstairs, the master suite awaits with sitting area, walk-in closet, and en-suite bathroom with double vanity and jetted tub. The second level has three additional bedrooms, and a full bath. The top level includes three bedrooms, a full bath, and generous storage areas. Pride of ownership shines through at every turn, with numerous updates and thorough maintenance. The landscaping is thoughtfully designed and lovingly maintained. There is central air conditioning on the first and second levels. Step across the street to enjoy the benefits of Elizabeth Park, including the new playground, free movies in the summer, and the energetic community life. 140 Elizabeth Street has 7 bedrooms, 3.1 baths, and 4,114 sqft on 0.31 acres. The home is offered for $495,000. If you’d like to see this home, please have your agent arrange a showing, or call Amy at 860-655-2125 to schedule a visit. More details and a photo tour are available. 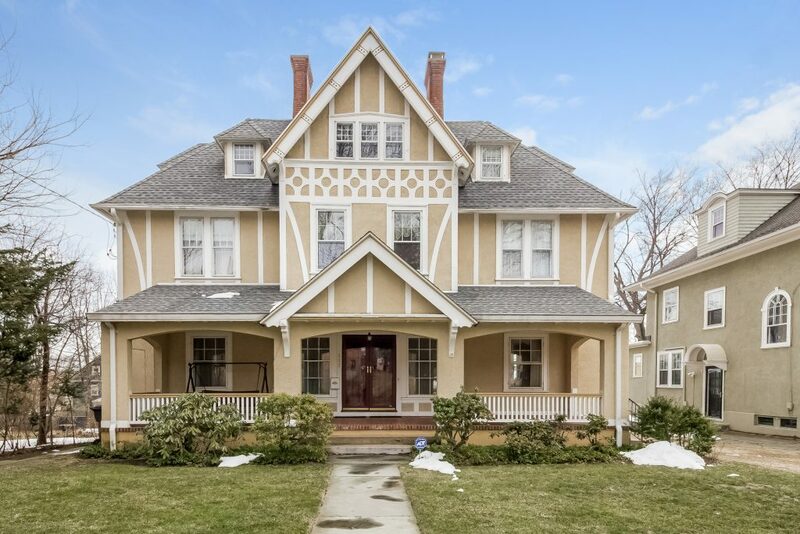 You’ll find an abundance of charm and functionality in this classic Tudor located in the Fairfield Avenue historic district. Stucco exterior and a slate roof honor past craftsmanship. Inside, an open foyer welcomes with a turned staircase. The formal living room showcases an oversized fireplace with original tile hearth. The room connects to a den with built-in bookshelves and the formal dining room. The remodeled kitchen has eat-in space and a pantry. A powder room completes the first floor. Upstairs, the master bedroom suite features a sitting room, double closets and half bath with shower and sink. Two additional bedrooms and a full bathroom with original tile complete the second floor. A spiral staircase leads up to the third floor which has another bedroom, full bathroom and storage space. The lower level walks out to the backyard and offers an additional 600 square feet of heated living space. There is an oversized family room with wood burning stove, another large room which could be used for an office, exercise room or play space, and a half bathroom. There is also a 1-car attached garage and laundry space on this level. The backyard is fully fenced and private. The home features many replacement windows, gas heat and hot water, and hardwood floors throughout. 343 Fairfield is offered at $289,000. If you’d like to see this property, please have your agent arrange a showing or call me at 860-655-2125 to schedule a visit. More details and a photo tour are available.